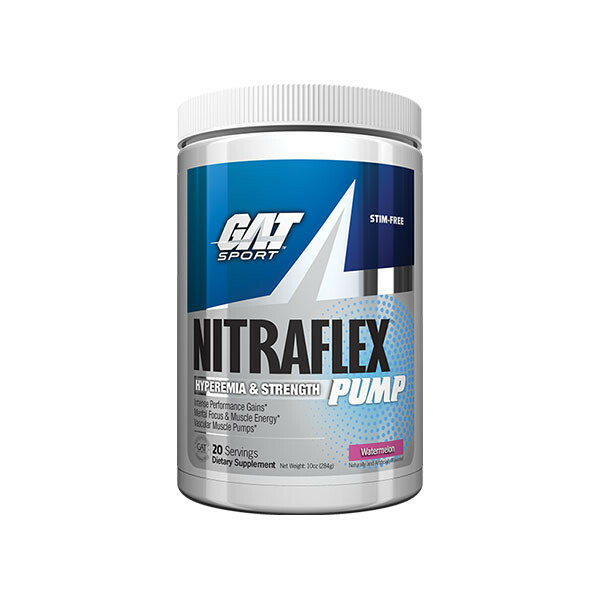 NEW NITRAFLEX® PUMP HAS THE POWER TO OUTPUMP! This scientifically complex power output formula is designed to create dramatically extended muscle pumps while weight training. Impressive, bigger and longer-lasting NITRAFLEX PUMPS! It’s Stim-Free, and won’t keep you awake after night training. Even those sensitive to stimulants can take it. Plus, it stacks well with other GAT products! Inducing advanced, blood-engorged Hyperemia Muscle Pumps takes precision, and the uniquely potent and athletics-enhancing formula in NITRAFLEX PUMP hits the mark. Clinically defined dosage matrix of L-Citrulline, Hydromax Glycerol, L-Norvaline, and Pine Bark boosts nitric oxide, dilates blood vessels for higher volume flow racing into muscles fights fatigue. It increases pumps and endurance. Agmatine Sulfate adds Nitric Oxide synthesis, muscle growth, and recovery. *Please note: Nutritional info may vary slightly between flavours. Citric Acid, Pineapple fruit powder, Silicon Dioxide, Malic Acid, Calcium Silicate, Acesulfame Potassium, Natural & Artificial Flavours, Sucralose, FD&C Red #40. Mix 1 serving (2 scoops) of NITRAFLEX® PUMP with 295-355ml of cold water and consume within 30 minutes before working out. Can take up to two servings daily. This product is strictly intended for use by healthy persons 18 years of age or older. Always consult a licensed healthcare professional before use. Keep out of reach of children.